Liath Luachra was a great warrior woman with a fierce spirit and the steadfast heart of a warrior. She lived in the mountains with Bodhmall, a druidess. Liath was not the marrying kind, preferring Bodhmall’s company, but she took in Bodhmall’s nephew Demne to raise from infancy. When Liath heard that Bodhmall was planning a journey to help her sister Muirne, She decided to accompany her, to ensure that everything was safe. On discovering that Muirne feared for the life of her newly born son Demne, Liath and Bodhmall resolved to take the child and rear him in the wilderness, away from his enemies. While Bodhmall softly cherished her sister’s child, and taught him wisdom, Liath set about teaching him all the tricks of survival and all the martial skills she possessed. By night she slept with one eye open, keeping guard on her two precious charges. By day she would take Demne and teach him how to learn from his surroundings. Each week she would tell him to study a different animal and not to stop watching until he had learned something important from them. From the ant he learned to have an indomitable spirit. From the fox cubs he learned to be playful, but also to give as good as he got. From the salmon he learned the valuable art of being still, and from this lesson he came home with his arms filled with a large salmon for them to eat. She would encourage him to race with the deer in the forest. She taught him to seek playmates in the animals of the forest, and to imitate all they did, thus allowing him to pick up the great arts of hunting naturally. She taught him how to cut and peel a birch bark to create an arrow that shot straight and true. She taught him to respect animals, but didn’t foster sentimentality. 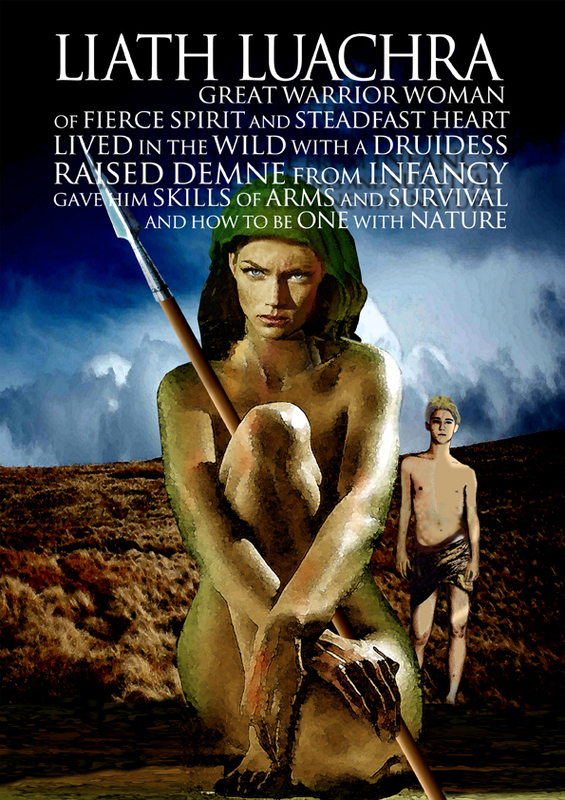 Demne knew well that to kill was a necessity for survival for them. Finding herself entrusted with the upbringing of a child, she dealt with it as she saw best, by teaching him the tools he would need in life. She put a lot of effort and focus into everything she did in life, from perfecting her own great skills to developing the warrior heart in a young boy. As a warrior she values competency, and the high expectations she had for Demne likely played a great part in making him the great man he was to become.